20 years. At present, he’s in the prison of Lenzburg, Switzerland. serving 2/3; Marco is not. renounce. He remains steadfast in his political beliefs. prisoner is entitled to a prison leave; again, Marco is not. movements; also, he took part in numerous protests behind bars. The latest list of ‘political prisoners’, compiled by Bristol ABC from a large number of sources, is now available. For an explanation of the need to support prisoners, and tips on writing to prisoners, see our resources page. In solidarity with all those locked up and still struggling! January 2011 finds us enthused by recent events around the world that point to the coming year as being a potentially significant one in the struggle against capital and oppression. Events in Belarus, Algeria and a little more successfully in Tunisia, show that many ordinary people can only be pushed so far before fighting back. Despite 2 decades of dictatorship and tightly controlled police states, and despite the consequences of resisting, people in these 3 countries have shown amazing bravery and determination. Marco Camenisch has announced another hunger strike from 6th to 8th December, in connection with the international week of solidarity with Silvia, Costa and Billy planned for the 6th to the 12th December. Marco has denounced the extreme isolation that Silvia, Costa and Billy are being subjected to by the Swiss state and has remembered the “Gathering Against Isolation”, which this year was organised by Turkish activists to commemorate once more the many prisoners died in the infamous F-Type prisons in Turkey. 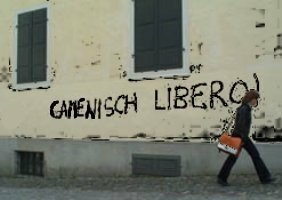 Marco Camenisch has been transferred from Zurich to a high security prison in Orbe, without even giving him the time to get ready or tell anyone! This happens after 8 years in Zurich, out of the blue and without any warning! We don’t know the reasons for this, but can make our own conclusions. We think this is due to his recent hunger strike together with Silvia, Billy and Costa; to the international mobilisations around long-term revolutionary prisoners; to his long-term committment and his contacts with the international movement. Once again the system is trying to isolate him, by transferring him to a high security prison far away. Solidarity is our weapon: let’s use this weapon by sending cards and greetings to Marco. Eco-anarchist prisoners Marco Camenisch, Luca Bernasconi, Costantino Ragusa and Silvia Guerini started an hunger strike the past 10th September. Marco Camenisch, known for his active role in the anti-nuclear movement of the 70s, has been a political prisoner for almost 20 years. As a militant green anarchist he has been taking part in struggles, campaigns and protests in and outside prison during all these years. He is currently detained in Regensdorf, near Zurich.